The Spirotech MB3 central heating filter is the leading filter for dirt separation. Not only does it collect no magnetic dirt it also has a very large outer magnet for collecting magnetic dirt. 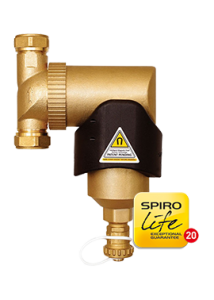 The Spirotech MB3 Comes with 20 years free warranty. Highly recommended for all types of boilers, especially high efficiency boilers. Unique dual action, automatically and continuously removes both magnetic and non-magnetic dirt from the heating system. Proven to improve energy efficiency by independent testers. Helps to reduce running costs. Helps to protect and prolong the life of components such as the boiler & radiators. Helps to reduce nuisance call outs by eliminating problems caused by circulating dirt. Slim design fits neatly on any pipework. Easily cleaned during the heating systems annual service. Guaranteed for life of the boiler to a maximum of 20 years.